Not everyone needs a weight distribution hitch. 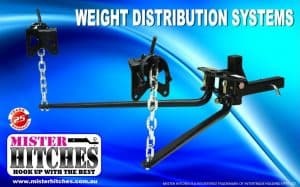 Weight distribution hitch kit: do I really need one? This vehicle/caravan combination has a problem, see the gap above the front wheel. If you think you do need a WDH read on. Looking at the above diagram you will notice that if the rear of the tow vehicle sags, the front of the tow vehicle lifts. This is the major problem as it reduces the effectiveness of your steering. While it may look nice to have the caravan/ trailer itself looking level, it is really the tow vehicle level that is critical. This will result in excessive trailer sway, poor handling, and difficulty braking – not to mention abnormal tyre wear. This combination shows what you want for safe towing. If you want to know more about towing, drop in and see Towbar Joe and have a chat about what you need. There is also further information in this article at Caravans Plus! Choose Midland Towbars today, your 1-stop vehicle accessory specialists!